Michelle Obama | can i just finish my waffle? Just heard what Michelle Obama says her second term goal to be if her husband (God forbid) is re-elected. First of all, what on earth could she mean by impacting the nature of food? Please, God, deliver us from this nightmare. It would be funny if it didn’t bring tears to your eyes. FLOTUS unveils MyPlate icon, Obama downs hot dog(s), chili & fries in Toledo. Shouldn’t she concentrate on getting rid of crime in the streets or feeding the hungry? Or maybe impact the nature of the food of those nearest and dearest to her heart first before she launches into our food. Someone once said something about getting the log out of your own eye first….. But we do not intend to let this 2nd term business happen. We have a chair to fill. Posted: 09.04.12 A. D. @ 3:45 p.m.
Democrats are voting on November 2nd this election? Well, according to the First Lady, I guess so. Sounds like a good idea to me. 🙂 There’s also a special election set up for them on November 7th. So that one new voter that you register in your precinct — think about it — that one neighbor that you get to the polls on November the 2 I want you to understand, that could be the one that makes the difference. That one conversation, that one new volunteer you recruit, that could be the one that puts this over the top. The presidential election this year is November 6. Posted: 08.23.12 A. D. @ 12:17 p.m.
Obama Foodorama details the unveiling of Michelle Obama’s new food group icon, MyPlate.org. It just got a little bit easier for kids and their families to follow the Let’s Move! campaign and try to eat like First Lady Michelle Obama. In Washington today, Mrs. Obama unveiled “MyPlate,” the federal government’s new primary food group icon, designed to be an easy-to-understand visual cue to encourage people to adopt eating habits consistent with the 2010 Dietary Guidelines for Americans. I can see Mark Levin’s head exploding from here. 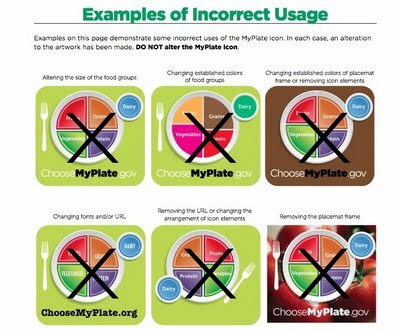 It comes with a little booklet, (very high end color printing job and probably very expensive) that devotes a page to dire warnings not to change this MyPlate icon in any way. Listen up, children, this is important. Below is the page dedicated to the improper use of MyPlate. Watch for the Obama MyPlate Food Police. Oh, here we go: “The icon cost about $2 million and months of work to design and to create, according to USDA sources.” That’s enough to pay a salary of $40,000 per year for 50 years. Outrageous. Cut. their. funds. Wasting money like this is outrageous any time, especially with so many out of work. And the MyPlate is so, so much better than the MyPryamid currently in use. Right! Horror of horrors. Imagine the food industry trying to sell more food. Can we get these people out of the White House? I see where POTUS escaped to Toledo yesterday and grabbed a hot dog with mustard, onion, chili sauce and cheese, with a bowl of chili and fries on the side. 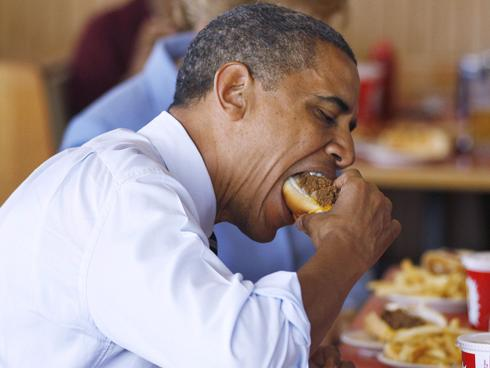 – President Obama, as he stopped for a bite at Rudy’s Hot Dogs in Toledo, Ohio. Some say it was TWO chili dogs…..
Posted: 06.04.11 @ 4:08 p.m.
Here’s a sure cure for obesity and it won’t cost a thing. Keep this picture handy and when you feel hungry, take it out as you try to eat that turnip casserole, or anything else for that matter. The pounds should fall right off. I think Michelle is recommending the sweet potato casserole, apparently an Obama favorite. The new book by Chris Andersen called “Portrait of an American Marriage” about the Obama marriage didn’t seem to be anything I would be interested in. I don’t find their marriage very interesting, but there seems to be some other things in the book that I do find compelling. The American Thinker has something written today that Dreams of My Father was produced, basically, by a ghostwriter – namely Bill Ayers. I read a little something about this before the election, but it was all covered up. It’s getting a little bit harder for the “fringe” press and media to provide cover. The mask has just about slipped completely off, but who does it reveal? That is the question. I’m afraid to know. It is now abundantly clear that the image of Barack Obama sold to the American electorate was tightly edited, air-brushed, and exaggerated. He has worn a series of masks — eloquent orator, brilliant scholar, centrist, and literary sensation. All of these masks are coming off as he copes with a job for which image will not suffice. For instance, hiding behind the eloquent orator mask is a guy who says “uhh” a lot when he is winging it, and who makes lots of factual and grammatical mistakes. Now, thanks to Jack Cashill, the literary mask has been removed. Obama is a literary pretender. Case closed. The evidence is overwhelming that Bill Ayers ghost-wrote Dreams from my Father, the book which established Obama’s pose as a brilliant writer (and therefore a fine mind, in the estimation of many). The media should be able to protect his reputation among the willfully blind but don’t expect to hear Obama make comparable boasts in the near future. The French and American First Couples attending the G20 dinner at the Phipps Conservatory in Pittsburgh, Pennsylvania on September 24, 2009. The FLOTUS is wearing Thakoon. More importantly, after this past week, I am wondering, who is the new leader of the free world? Due to Mr. Obama’s fascination with Abraham Lincoln, I have said, “please don’t let him go to any plays.” But alas…..
After the play let out at about 11:30 p.m., the presidential motorcade went down Sixth Avenue, shut down by the NYPD, and onlookers packed onto the East side of the street cheered as the presidential motorcade passed as the Obamas headed back to JFK for a return flight to Washington.